Jimmer Fredette and Ohio State aren’t the only ones under pressure in the NCAA men’s basketball tourney. 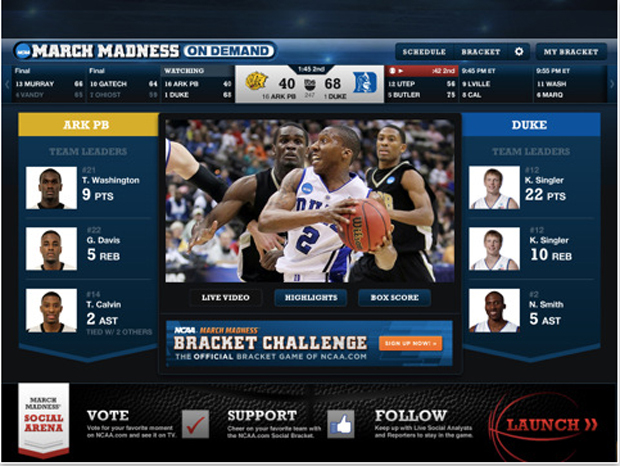 So is Turner, which is out to deliver the ultimate online experience in its March Madness debut. As the NCAA men’s basketball tournament brings our national productivity to a halt, with 36 games between last Tuesday and this Sunday, there are plenty of intriguing storylines. Will top-ranked Ohio State continue to dominate? Which Duke team will show up, the one that routed UNC in the ACC tournament, or the one that UNC routed the previous week? Will Jimmer Fredette, BYU’s insanely prolific scorer (28 points a game), shoot his team into the Final Four? As part of a $10.8 billion deal that edged out ESPN last year, Turner and CBS are broadcasting the tournament together for the next 14 years. Every game appears one of four national networks–CBS and Turner’s TBS, TNT and truTV. So far, the combo is working well. The tourney’s opening double-header on truTV Tuesday night, part of the NCAA’s newly expanded 68-team field, drew 2.6 million viewers. On Thursday, total visits online and through mobile apps were up 22 percent over last year (4.1 million online and 774,000 on apps), and TV viewership was up 19 percent over last year to 7.4 million viewers, the biggest audience in 20 years. Also on Thursday, the MMOD iPhone and iPad app hit No. 1 in Apple’s App Store. CBS has televised March Madness for years and it streamed games last year, but Turner should transform the online experience. The company is a digital powerhouse, the invisible creative force behind NBA.com, PGA.com, and Nascar.com, the top sites for those sports. 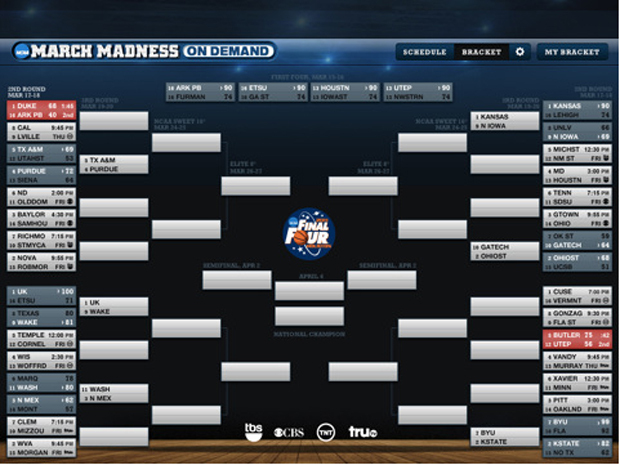 Now Turner is applying that expertise to March Madness on Demand, or MMOD, which offers the sort of customization and controls that it has honed for years on other Web properties. Finding games: If you plan to watch games on TV, the service is a convenient guide for navigating dozens of teams and games over four networks, which could otherwise be a scheduling nightmare. By entering your zip code and cable provider, you get the local TV listings. TV companion: MMOD is designed for multimedia fans who watch TV with a laptop or iPad in hand. You can pull up live box scores, check out highlights and follow the lead-tracker chart that tells the story of the game since tip-off. Surfing: Every game is available for streaming online. From the bracket page, schedule or scoreboard, you can click and bounce from game to game, checking in on various games. Get social–The March Madness Social Arena features tweets by CBS and Turner TV analysts, such as David Aldridge and Seth Davis, as well as fans. With the help of students in the Sports Link program at Ball State University’s communications department, Turner is monitoring and filtering March Madness discussions throughout social media to include the most relevant tweets. 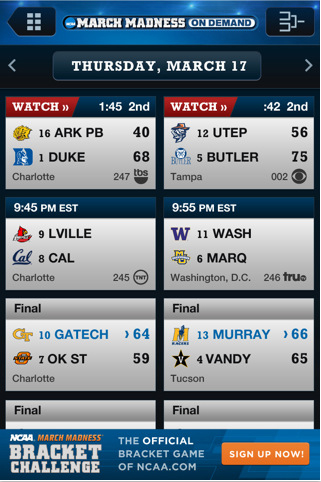 Bracketology: Turner and its partners, CBS and SI.com, each offers a bracket game, but Turner’s works seamlessly with the MMOD iPhone and iPad app so you can see how your picks are doing. It shows the latest scores and indicates which games are live. Alerts: You can set the MMOD app to let you know when your team is playing, when an upset is in progress and when a game comes down to the wire so you can watch the last-second dramatics. Follow Chuck Salter on Twitter at @ChuckSalter.